Errata in the effects of QE corrected 10/21. Market liquidity is crucial for well-functioning capital markets. There has been a quite lot of talk about diminished market liquidity and the role of machines in it (see, e.g. Q-review 4/2017, this and this). These are worrying developments. However, while market liquidity is crucial for markets, global financial flows, i.e. liquidity, is also essential to the real economy and for global economic growth. The availability of credit on a global basis fuels investments and growth around the world. Such financial flows fell by a massive 90 % during the 2008 crisis, which quickly translated into a global recession. Investment and consumption collapsed almost everywhere, with the exception of China where a massive credit stimulus was enacted. Since then, there has been an uneven recovery. Cross-border bank lending has never really recovered (see Q-review 1/2017), but the issuance of vast amounts of government and corporate debt has taken its place. This creates a serious risk for the global real economy if highly over-valued capital markets crash. Global outside-US dollar denominated debt has risen to a record. The role of non-bank institutions on providing funding has increased. 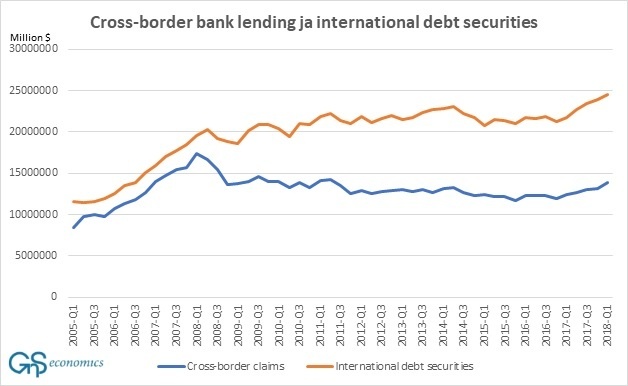 The composition of international credit has shifted from bank loans to debt securities. Combined with the asset purchase programs of central banks (QE) these developments have far-reaching consequences for the global economy. Currently, non-banking institutions and households outside the US hold over 11.5 trillion worth of dollar-denominated debt—a record. The “shadow banking” sector could conceivably hold the same amount. This means that all policies affecting global dollar liquidity, will have a large effect on the global economy. The increased role of non-bank institutions in providing credit means that an increasing proportion of international finance comes from unregulated sources. Effectively, this means that these institutions, including money market funds, investments banks, etc., have unwittingly assumed even bigger risks in their lending practices than commercial banks. This also means that when the downturn comes, the share of non-performing and/or defaulted loans will grow higher than before. As we have noted several times (see, e.g., Q-reviews: 2/2013, 1/2016, 1/2017, 1/2018), the QE-programs of central banks have distorted prices and, therefore, underlying risks in the capital markets. Moreover, the artificial liquidity created by these programs has spread to stock, junk bond and even real estate markets (see Q-review 1/2018). However, QE-programs have had the biggest effect on government bond markets. The prices of sovereign bonds have been relentlessly driven up (yields have collapsed) to unprecedented levels across the globe. This in turn has fueled the expansion of debt issuance in international credit markets and which has made it possible for non-bank sources to increase their role in the economy. There has also been a re-balancing towards more risky assets. Artificially-high asset prices have been supported by the intrusion of CBs in public capital markets, but this is now ending (see Figure 1). The Federal Reserve has already begun to reduce its balance sheet (QT), which has been one of the main reasons for retreating global dollar-liquidity, rising interest rates, and the recent downturn in both emerging and now developed stock markets. Figure 1. 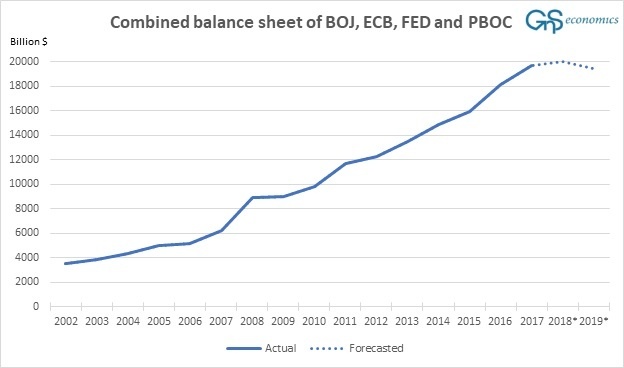 The combined balance sheet of the BOJ, ECB, FED and the PBOC is US dollars and its forecast. Source: GnS Economics, BOJ, ECB, FED, Trading Economics. What follows the onset of global QT, which seems imminent, is a chaotic correction towards the true market pricing of risk (a crash). Because capital markets carry a larger burden of global finance than before (see Figure 2), their collapse would immediately eliminate funding for companies, households, and even governments globally. Such a dramatic reduction in global liquidity implies an instant recession. This would then be followed by a wave of bankruptcies by “zombified” companies (those with the weakest capital structures, dependent upon loose credit conditions for survival) further accelerating the world economy into a potential depression. The collapse of the ‘everything bubble’ created by central banks does thus directly threaten not just asset markets but also the real economy. If (when) the asset markets crash, we will see a dramatic fall in global liquidity which will paralyze both capital investment and consumption. A perfect storm in global capital markets, banking sectors and—most importantly—the real economy is likely to develop with frightening speed. What this means is that we might be heading to the largest economic crash in human history, whose aftermath would not spare any corner of the global economic order. This is truly a scenario from our worst nightmare, and we know the creators. Central bankers have set us up. PhD (econ.) Tuomas Malinen is the CEO of GnS Economics and an Adjunct Professor of Economics at the University of Helsinki. He is specialized in economic growth, economic crises, business cycles, monetary unions and central banks. The world economy: The way of Japan?